Wrist Art by Rolex. A watch made for a discerning gentleman.. Dark and slick, this Rolex watch is primed for a day of hard work before a night on the town. Clutching your wrist like a metal guard, this modern and stylish watch exudes prominence and wealth. It is designed for the powerful businessman or woman, either ready for a day of money-making or an important meeting over coffee. Best worn resting next to a comfortably dressed suit, this watch will standout amongst your outfit, which is exactly the type of fashion detail that catches the eye of the contributors and readers of ‘The Accessories Guild’. Take a look at the true meaning behind wrist art by Rolex, which is the ‘Rolex Blacken GMT Master II. 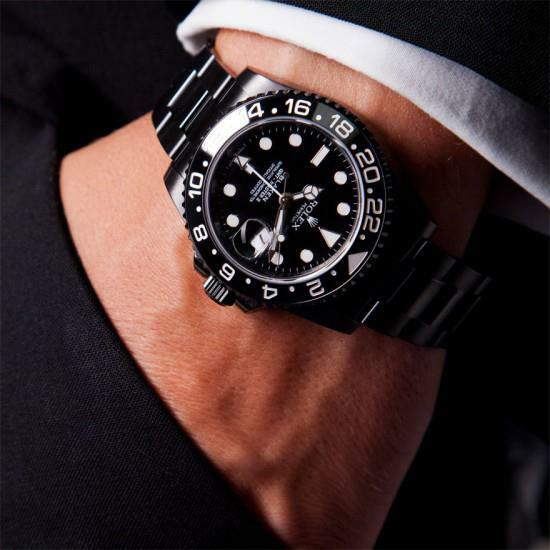 The Rolex Blacken GMT Master II is the quintessential source chosen by serious professionals who travel the world. The specifications; RRP: $9,500 USD, Model Year : 2012 , Movement: Automatic, Case Material: Solid Steel, Bracelet Material: Solid Steel. Be Guided by the Guild!